Hostsonaten is a project led by Finisterre bassist Fabio Zuffanti, with a rotating cast of musicians under his direction (including members of Finisterre). For fans of the classic Italian progressive rock sound, Finisterre is among contemporary progressive rocks very best. 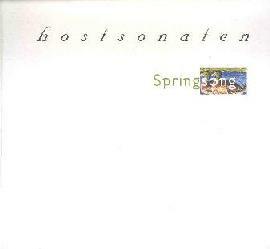 Springsong is the third Hostsonaten release. I haven't heard the second, and as much as I enjoyed the first, Springsong is light years ahead of it and may well be the most stunningly beautiful and inspirational albums I've heard this year. The promo sheet states that Springsong "is dedicated to and inspired by the intimate legacy between man and nature The music of Springsong looks back to the time when human beings lived according to natural rhythms and it has the colors of Renaissance masterpieces". And indeed the music does communicates this theme. Instrumentation includes flute, violin, piano, acoustic and electric guitars, bass, drums, percussion, organ, mellotron, moog, saxophone, bagpipes and recorder. The music flows smoothly from beginning to end, mostly communicating a feeling of serenity while still holding adventurous listeners interest with well executed compositions. The Renaissance feel is often apparent and I agree with the promo sheet analogy with Anthony Phillips' The Geese and the Ghost album. But there are also parts that are on par with the full majesty of Finisterre, particularly on "The Underwater And 2nd Reprise" and the 13 minute "Toward The Sea". GORGEOUS guitar work from Stefano Marelli!! There are also jazz influences and even moments of Celtic sounds. In summary, fans of Italian progressive rock and general prog rock that is dominated by acoustic instruments and a medieval flavor are sure to love Springsong. Great care has been taken in the packaging which also deserves a mention. Inside are 10 CD package sized cards, each with artwork and a song title on the front and song credits on the back. Very nice. For more information you can visit the Hostsonaten web site at: http://digilander.iol.it/hostsonaten/. Springsong is distributed by the Sublime Label. You can visit their web site at: http://www.sublimelabel.com.